Our New Year's resolution was to do at least one family activity or outing, just the five of us, every week this year. This is week 6 of family fun. Last week, our good friend Sheri turned 40. To celebrate, her family went to The Old Marina Restaurant beside Puslinch Lake. 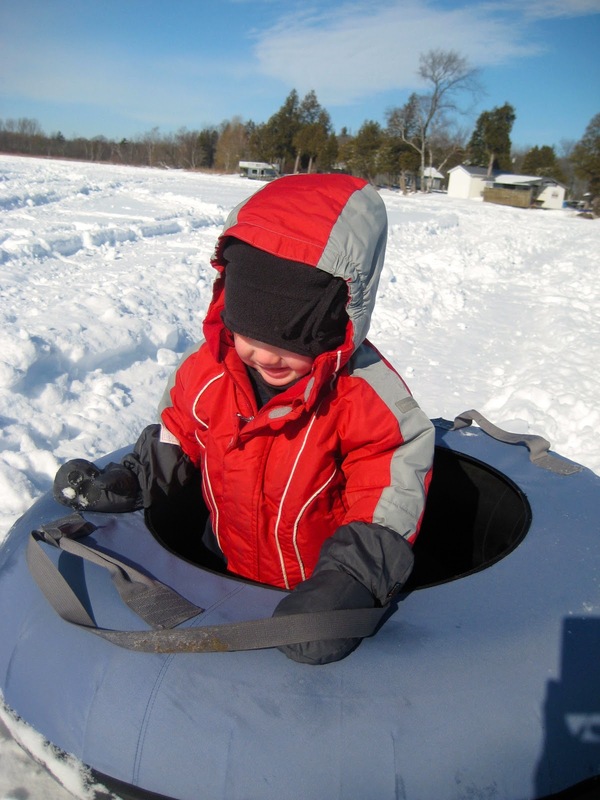 They gave it a great review and thought we would enjoy watching the ice fishing on the lake. 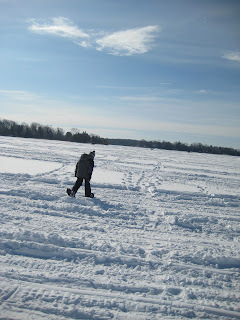 I have always wanted to see ice fishing so we went to the lake for family fun on Sunday morning. It wasn't too cold on Sunday morning, -10º or so, but the large ice cube (i.e. the frozen lake) had a big effect. My feet were cold walking out on the lake. One of the ice fisherman said that they sit with their legs out-stretched and just the back of their heels in contact with the lake for this reason. It was interesting to see the ice fishing. Finian and I saw two guys catch a pretty big pike (I think) and then drop it back in. The fishing rods they use are pretty tiny. There were are about 20 little groups out on the lake fishing. Fiacra and Ailbhe were, for some reason, full of complaints. Fiacra was feeling a little off colour. The snow on the lake was fairly deep and it was hard work walking through it. I don't know if it was that, or their feet were cold, or Fiacra wasn't feeling well, but they were happy when we turned around to go back to the restaurant. The complaints continued in the restaurant until I suggested that we take turns listing our complaints, we often take turns telling the interesting parts of our day, so a slight variation on that! Ailbhe: I am very very very tired. My knee aches and there is NOTHING I want to eat on the menu. Fiacra: I am very very very tired and very hungry. Me: I am too hot wearing my snow pants. And that was all it took, the grumps were happy again. Or maybe it was the arrival of the hot chocolate. Connell and Finian were off looking at the trains but I assume they had no complaints at all. Ailbhe found something she wanted to eat and we had a lovely lunch. Even Finian, our terrible eater, ate a good lunch, completely enthralled by eating with a toothpick.